If you're looking to purchase your favorite gun from Red Dead Redemption 2's single-player campaign in Red Dead Online you might be paying a premium. Just like in Red Dead Redemption 2's single-player campaign you can earn money by completing missions and completing tasks. You can then take that hard-earned cash and take it to either the town stores or the catalogue and shop for things like clothes and weapons. 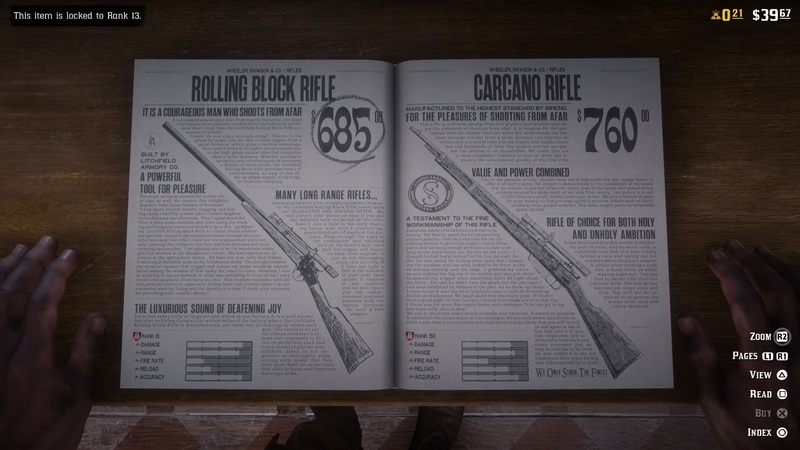 The weapons you can buy are the same from the ones you can get in Arthur Morgan's story except for one thing: the price. There are two types of currency players can earn in Red Dead Online. Regular cash which can be used to purchase weapons, and Gold Bars which is a premium currency in the game. Players can earn gold nuggets in the game and automatically combine 100 nuggets into a single gold bar. Details on Red Dead Online's microtransactions are scarce at the moment but no doubt we will hear more as the beta rolls out. For more on Red Dead Redemption 2's online mode check out our Red Dead Online beginner's guide.